I haven’t written a post in a while…not that Mom hasn’t been on my case to do so. She is on vacation so I thought I would surprise her and hop back in here again. I am currently enrolled in the Masters of Oriental Medicine and Acupuncture at AOMA Graduate School of Integrative Medicine in Austin, Texas. 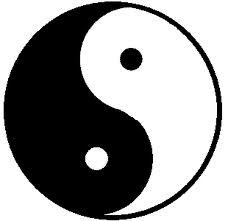 Yes, I am very busy but I am learning so much about Traditional Chinese Medicine (TCM) that I do eventually want to share it all. I just have to learn how to communicate it! 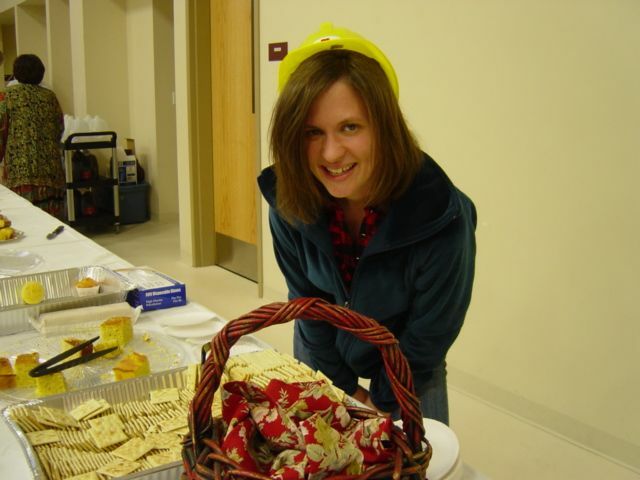 I had written before about my journey in trying to regain my health. I moved to Austin last summer and found access to alternative healthcare resources here. I had continued to experience fatigue and anxiety…tried some acupuncture at the AOMA student clinic and had a blood test with follow-up herbal treatment for my liver at a local chiropractor…but these have still continued. I experimented in November with homeopathic HCG (very diluted version of hormone) as I also wrestle with my weight. The scale creeps up if I don’t watch it. I was on the diet and drops for 18 days and lost 10 pounds, mainly around my torso. But monthly hormones stopped me cold as I was supposed to continue on the drops for a minimum of 21 days to maximum of 41 days. I loved how I looked but could not go the distance or maintain the loss. During the holidays, I got searching on the Internet and found a clinic that provides the hCG shots (actual hormone) within a comprehensive 12-week wellness program. Well, of course that costs more than just buying the homeopathic version and doing it on your own…but since I had obstacles I could not overcome on my own, I signed up. I was curious when I first started researching HCG weight loss information and I figure I can at least provide others with what actually happens to me. I am excited. The program begins with a four-week cleanse. I am on a restricted diet as to choices, but for most of the time I can eat any amount I want. Highlights of what I cannot have: red or deli meats, eggs, dairy or milk products, gluten or corn products, nuts or seeds and dried fruits. I also drink a powered functional food supplement (chocolate) that I whip up in the blender to make sure it mixes well. I completed this and had a 4.5 loss on the scale for the week. I know, mainly water! I also found out through blood and saliva tests taken at the initial visit that I need some hormone and thyroid prescriptions and Vitamin D3 and Iron Glycinate supplements. I am happy to have the additional support resulting from these tests. But what also has me thinking is that except for the dairy and gluten, I eat most of the eliminated food items I listed all the time. When I go on maintenance, I am definitely rethinking what comes back in my diet. It is funny how old habits take new forms…so even though eating gluten-free and more simply, I am highly motivated to evolve yet again to eat the kind of fuel that would maintain my now older body, but hopefully lower body weight. Good to be back and more to come! Quinoa (kee-nwa) was an ancient food of the Incas – it was considered sacred and referred to as ‘mother of all grains’. Although no longer widely known or used it is gaining in popularity due to its nutritional qualities and versatility. Unlike most other grains and seeds quinoa contains all of the amino acids needed for humans to assimilate as a high-value protein. In addition to being gluten-free and easy to digest it is a good source of dietary fiber, protein, phosphorus, magnesium and iron. The quinoa seeds, as harvested, have a somewhat soapy and slightly bitter coating of saponins that discourage birds from consuming the seeds. Most quinoa available at your local grocers has been pre-soaked and rinsed to remove this coating. I always soak and rinse my quinoa whether it is presented in bulk or packaged and labeled as pre-rinsed. This insures that the seeds are clean, tender, and ready to accept the seasonings in your recipes be they sweet or savory. Evidently a short-lived experiment in raising quinoa without the saponins coating resulted in birds consuming most of the harvest. 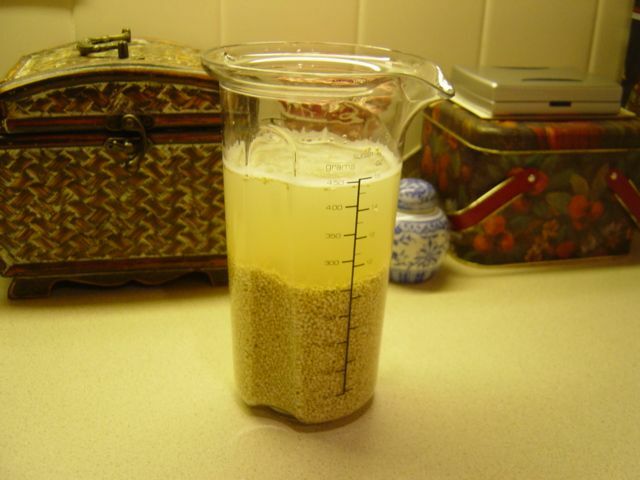 And so I soak . . . .
1) Measure out the quinoa and add enough water so that the mixture is slushy when stirred. 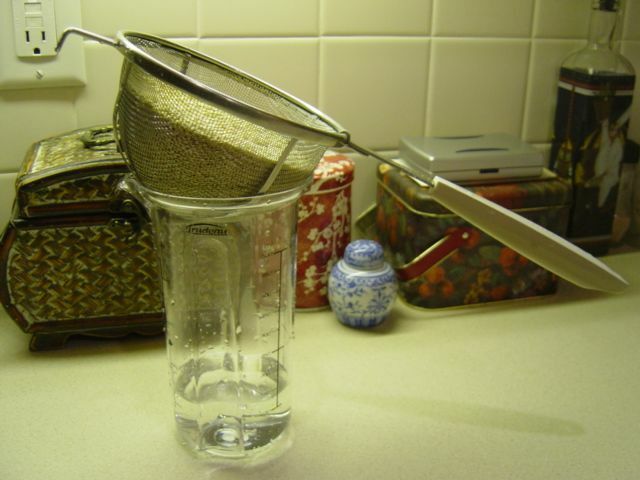 2) Pour the slush into a mesh strainer and thoroughly rinse. If the soaking water is only slightly hazy when stirring then 15-20 minutes is probably enough. These pictures are of bulk quinoa that needed about an hour of soaking and a change of water to clear. 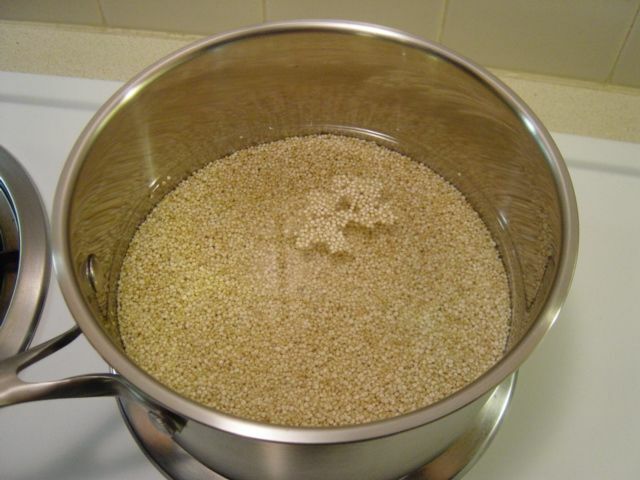 3) Dump the soaked quinoa into your pan and cover with water. Turn the heat on medium until the mixture starts to bubble. Then turn the heat down low and put on the lid. Watch it very carefully until it settles down to a steady simmer because like oatmeal or pasta it will make fierce bubbles that climb the pot walls and boil over onto the stove. 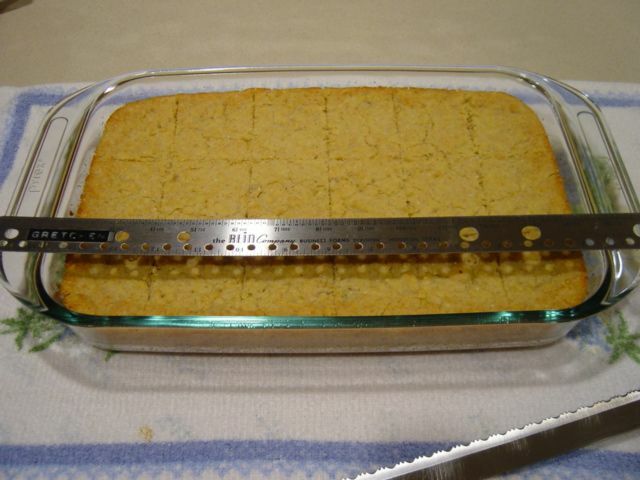 4) The quinoa is done when it looks something like a sand dune on top with minor dips and valleys that are no longer moving. There should be no liquid visible when you take a spoon and check the bottom of the pot. Cooking quinoa is similar to cooking pasta in that you may prefer it very tender or ‘al dente’. You may pre-cook it for a recipe or add it directly to liquids in the recipe. It has the capacity to absorb an amazing amount of flavor from added ingredients. I pre-cook it over low heat for 15-45 minutes; then turn off the heat and let it cool slowly on the burner. The longer it was soaked the shorter the cooking time. Also, if there is still water and it is cooked as long as you like then just drain of the excess water. If you cook it without salt or seasoning then you can use a portion of it in a sweet recipe and the remainder in a savory dish like this one. 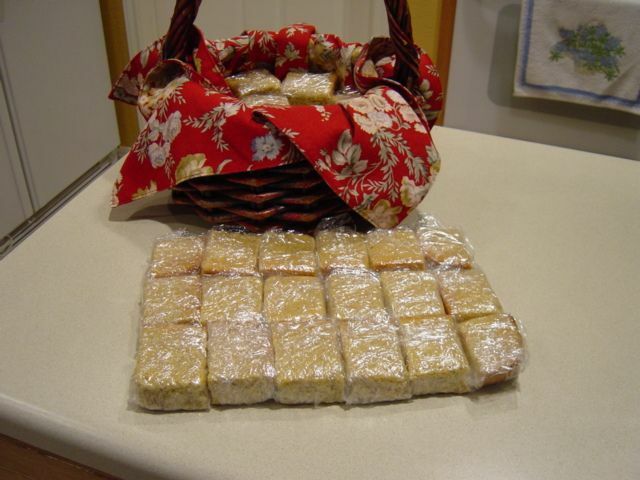 This basic recipe was served at a potluck lunch meeting and received very favorable comments. It was prepared with a large, sweet onion and two fresh tomatoes. I included some ground turkey breast to make it a main dish meal. 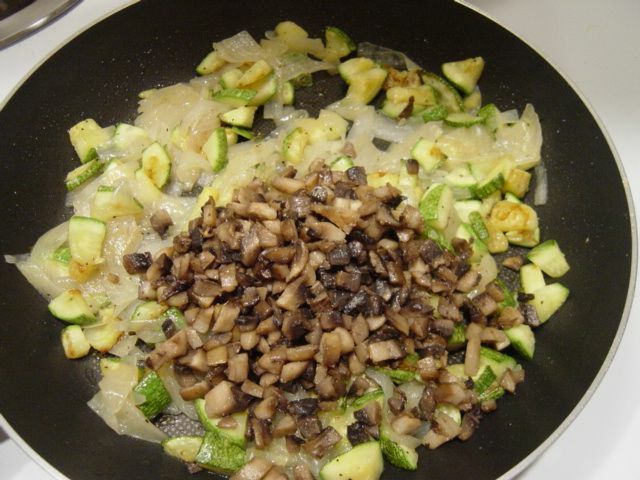 Heat the oil on medium or medium high in a large skillet that has a lid. Add your mustard and bay leaf to the oil and let it sizzle. Stir while adding your cumin and wait a few seconds before adding the onion. Sauté the onion until it starts to soften and turn brown. Add ginger, tomatoes (or zucchini/carrot), and turmeric. 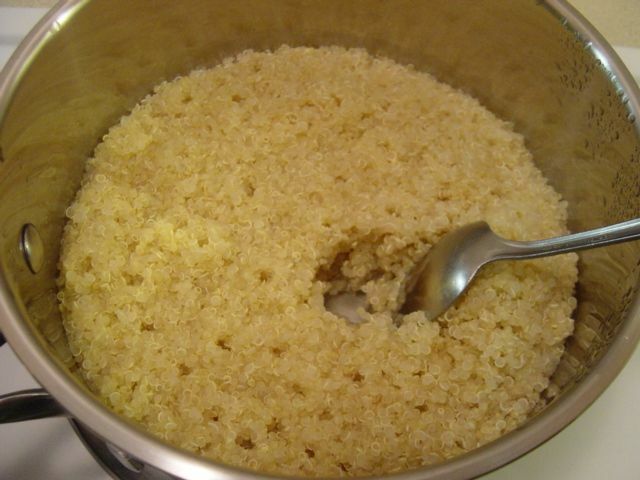 Let soften and then add your quinoa, stirring it in gently and sprinkling with salt. Reduce heat and cover, cooking for 8-10 minutes. Remove from heat, stir once, sprinkle with cilantro, cover, and let sit for 5 minutes. Fluff and serve. If you add meat, tofu, or beans then include it already prepared along with the quinoa. 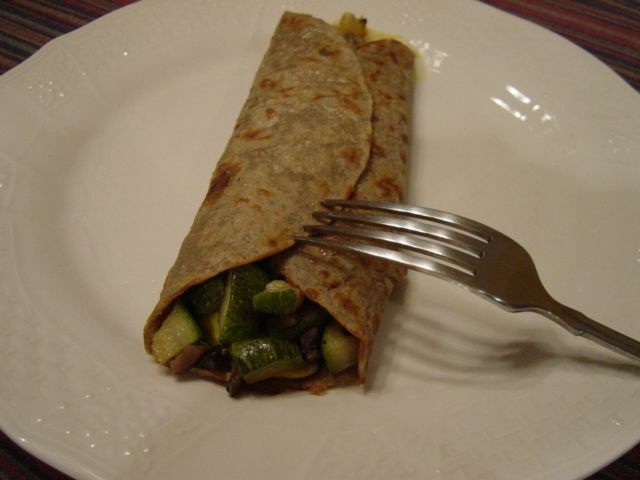 This is a good recipe to extend leftovers from another meal. And any local vegetables in season are excellent options. Edible Austin presents author Alain Braux talking about his new book, Living Gluten and Dairy-Free with French Gourmet Food at BookPeople on Monday, February 14, from 7–9 pm. Treat yourself (and perhaps a loved one) to an evening of conversation with Chef Braux (recently named in the Top 10 Food Celebrity list as well as a Best Sweet Bites of 2010 by the Austin Chronicle), who will prepare his bliss-inducing Flourless Chocolate Torte for us. Also meet Sarah Bartholow from Hail Merry, who will be sampling a selection of their scrumptious gluten-free and vegan products. We’ll also have a selection of celebratory beverages on hand. Free! Alain’s comment `gluten-free junk food is still junk food’ is such an astute observation. He believes we should eat thoughtfully, be aware, and indulge joyfully on special occasions. Enjoy dessert on Valentine’s Day at Book People and chat with Alain – he loves to talk about food! For those of you who live in Georgetown you can find a copy of Alain’s book at the Georgetown Public Library – NBNF 641.563 BRAU. Alain is also the author of How to Lower your Cholesterol with French Food. Both books are available at Amazon in paperback or Kindle editions. Rita and I visited with Alain recently at People’s RX at the Westlake location where you will find an extensive gluten-free grocery section and gluten-free options in the deli. The North Lamar and South Lamar locations also have gluten-free options in the deli. Rita is a full-time student this semester and Mom is in the background supporting her efforts as best I can. It is most important these days to keep up the nutrition and avoid the gluten. Many of the new gluten-free products becoming available are still in the fast-food, empty-calorie, snack-food category that we try to avoid. And so we cook. This started out as a hearty chili recipe tailored to eliminate some of the elements that Rita is trying to avoid in addition to the gluten. One of those is all nightshade foods, especially tomatoes. The initial recipe caught my eye because the tomato in the recipe was replaced by pumpkin. We are both fans of all things pumpkin so we were very enthusiastic about the possibilities. The lean white pork also met with our approval although it can be substituted with a vegan option or eliminated entirely. I printed out a starter recipe and carefully noted every little change as I went along. The seasoning changes strayed so far from the original recipe that it had me quite anxious about the final result. Toward the end I emailed Rita what I had done so far and asked for her input on the choice of beans to be added. She chose navy beans but any favorite bean can be substituted. The result is something that I think is very tasty. Rita admitted to me that she liked it so well that she was having a bowl for breakfast as well as for dinner. So I am hoping that this is useful for all the nightshade-challenged individuals trying to stay healthy! Put the beans on to soak a day ahead of time so they can be cooking while you prepare the sauce. Drain, rinse and add enough water to cover and cook the beans in a 2-quart saucepan. Do not add salt as this can cause the beans to be tough. Cook gently on the lowest heat necessary to keep the water bubbling. When they are tender remove the lid and leave on low heat. Reduce the liquid to retain the nutrients without excess liquid when you add the beans to the remainder of the recipe. Use a 4-quart, heavy bottomed saucepan or Dutch oven to prepare the sauce. Add the olive oil to the pan and sauté the pork (or substitute) over medium high heat until it is lightly browned. Stir in the onion and celery. Cook and stir for a few minutes until tender and fragrant. Stir in the cumin, coriander, garlic powder, cloves, nutmeg, black pepper, salt, savory, and marjoram. Also add the water and pumpkin. Bring the heat up slowly and simmer, covered, for about 30 minutes or until the pork is tender. When you taste the sauce it will seem very flat. This is where the cider vinegar comes in. It adds the sweetness and tang that you are looking for in a chili. Start with 1/3 cup and taste to see if you want a bit more. The difference is quite amazing. Add the beans. Simmer for another few minutes. Top with the fresh cilantro if you are using it. PS – There were no pictures. I was too anxious to remember while in process and it went directly into the freezer until I was able to get it to Rita. However, here is a picture of my breakfast this morning. Ricki Heller at Diet, Dessert, and Dogs is writing a new cookbook centered on gluten-free breakfast dishes for those battling Candida infections. 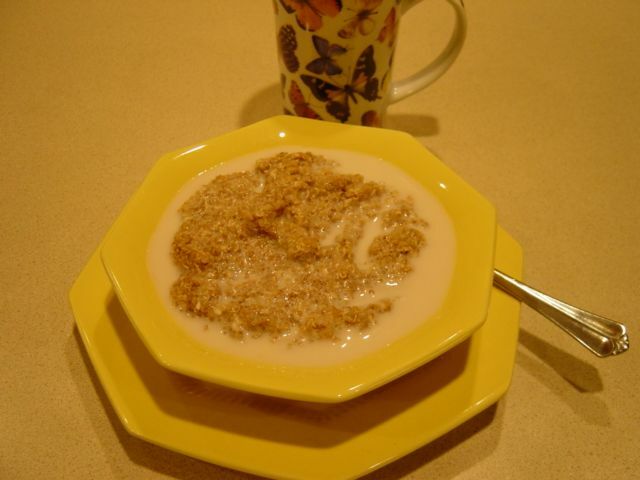 This was SO yummy – flavor, texture, and nutrition all wrapped up in one bowl of hot cereal!